Be the first to share your favorite memory, photo or story of Sandra (Sandy). This memorial page is dedicated for family, friends and future generations to celebrate the life of their loved one. 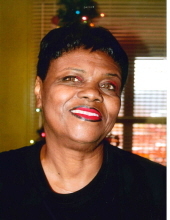 Mrs. Sandra (Sandy) Gentry Gilreath, age 62 of Wilkesboro passed away Tuesday, April 2, 2019 at Wake Forest Baptist-Wilkes Medical Center. Funeral services will be held 3:00 PM Sunday, April 7, 2019 at Reins-Sturdivant Chapel with Pastor Brent Bailey and Bishop George Morgan officiating. Burial will be in Scenic Memorial Gardens. The family will receive friends from 2:00 until 3:00 PM prior to the service at Reins-Sturdivant Funeral Home. Mrs. Gilreath was born March 7, 1957 in Wilkes County to Junior Huey and Betty Evelyn Redmon Hague. She was a member of Grace Kingdom Life Ministries and a 1975 graduate of Wilkes Central High School. She was excellent in interior decorating, fashion design, cooking, traveling and spending time with family and was awarded Mother of the year award from former Ministry Wings of Healing Tabernacle. She was preceded in death by her mother and a grandson; William Kenneth Gilreath, Jr.
She is survived by her husband; William Gilreath of the home, two daughters; Sonya and Tia Gilreath both of Wilkesboro, one son; Kenneth Gilreath of Purlear, father; Junior Huey Hague, three grandchildren; Jayveon Ross, Logan Sharpe, Alena Gilreath, one sister; Deborah Nelson of Moravian Falls, three brothers; Michael Gentry and wife Gail of Mebane, Junior Hague of North Wilkesboro and Thomas Hague of Columbus, OH. and two goats; Zibi and Zoey. Flowers will be accepted or memorials may be made to Grace Kingdom Life Ministries, PO Box 124, Wilkesboro, NC 28697 or New Direction Ministries, 1340 Statesville Road, North Wilkesboro, NC 28659. To send flowers or a remembrance gift to the family of Sandra (Sandy) Gentry Gilreath, please visit our Tribute Store. "Email Address" would like to share the life celebration of Sandra (Sandy) Gentry Gilreath. Click on the "link" to go to share a favorite memory or leave a condolence message for the family.